H&N? Hugo BGSS? 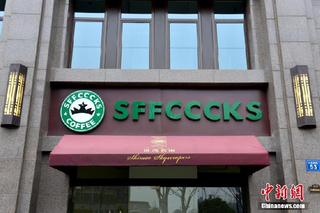 And SFFCCCKS Coffee? Welcome to Wuxi city, which might be home of the phoniest shopping street in all of China. The signs are located on a shopping street at Shimao Skyscrapers. Instead of Apple, there's "Appla." Instead of Zara, there's "Zare." H&M is "H&N." These don't appear to be actual shops (though, they could be! ), but rather, logos and facades for the building complex—kind of like a movie set. The photos below have been circulating online in China recently. Nothing is safe! As website HugChina points out, even China's largest bank is knocked off with a fake sign. According to Jeremy Blum at South China Morning Post, these are pre-made signs for empty shops in hopes of creating potential buyers. However, online in China, the street has become an object of ridicule. Some call the signs "misleading" and "infringement," and are asking for the practice to stop.